Once traveling to Cambodia, Angkor Wat is a must –see; however, best Cambodia tours reveal us much more. This personalized Cambodia tour offers opportunities to explore ruins, villages and more remote natural and best cultural areas of Cambodia. Early departure by overland escorted by English or French speaking guide and private car or pick up truck to Mondulkiri, a province of 543 kms north of Cambodia. You will first part of the road from Phnom Penh to Kampong Cham and Snuol is in best conditions. The rest of the road from Snuol to Mondulkiri is dirt road. We will drive through the jungles of Cambodia. Some parts of the road are high plateau or hillside. Please keep your eyes open as you will see many kinds of wild animals crossing the road. Arrives in Senmonorom, a town of Mondulkiri province later in the early evening. Check in at hotel, straight your leg or walk around the hillside of the hotel. We travel 7 Km north of Sen Monorom to visit the village of Pu Lung, where elephant treks are organized.. Full exploration of the forest by elephant. Lunch on site. This is hard at time but still funny experience and best way to explore the landscape close up. In the mid afternoon we meet up with our car and diver back to Sen Monorom. Overnight at Sen Mornorom hotel. Today, we set off for 37 Km on the bumpy road along two rivers to the most famous waterfall, Bousra Waterfall. Along the way, you can explore Bousra beautiful scenery with its rice fields, dense forests and have chance to visit traditional Phnorng villages as well as a coffee and paper plantation. Enjoy the bath at the waterfall. Picnic lunch is included at the side. Return to Senmonorom town in the afternoon, enjoy peaceful walk through the quiet road of Senmonorom, a kind of relaxed moment. No other places where you can have such a quiet walk like this town. We will leave by the same adventure road, through the forests back to the main road at Snuol where we continue to Kratie. Part of the road from Snuol to Kratie is in best conditions. The trip will take you about 5 hours to arrive in Kratie. In the afternoon, we will spend our time, visiting the Mekong River Dolphins at Prek Kampi Reserved area. The rare water dolphins are available to be seen here only. We will leave from Kratie by road to Chhlong District. Chhlong still remains many kinds of colonial houses, buildings and old cultures of the people from the French's time. This is the only place where you can find those old colonial house styles available. We will then continue to Kampong Cham by dirt road. Arrive in Kampong Cham, check in at hotel. Visit Wat Nokhor with its ancient temple and modern style pagoda (12th century). After breakfast, depart for Kampong Thom. En route, we will stop for the visit to Wat Khear Nokor, and Phum Prasat, continued with Prasat Sambor Prei Kuk, located 35 Km northeast of Kampong Thom. 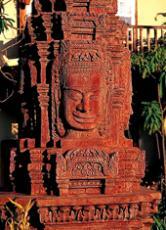 Visit the ancient capital of Chenla with its 100 temples dating from the Pre-Angkorian period. Finish visits, we continue the journey to Siem Reap. Arrival in Siem Reap, check in hotel for relaxation. Morning free for your own activities. In the afternoon, depart for Mechrey, a small floating village surrounded by flooded forests of mangrove trees, approximately 10 km from downtown Siem Reap. Board a local boat for a cruise along Tonle Sap Lake. We will pass through mangrove forests, visit a floating primary school, stroll around the Mechrey pagoda situated on a small island surrounded by floating houses. Visit some private houses and a fish farm where we can see first hand how the local people farm fish. The cruise then continues along a broader water-ways, home to a wide variety of bird life. The boat returns to the pier where our waiting vehicle will drive us back to Siem Reap. Sunset from Phnom Bakheng, one of two hills dominating the plain of Angkor, from where you will have a spectacular view of the Western Baray and Angkor Wat. This morning, visit to the Roluos Group. The monuments of Roluos, which served as the capital of Indravarman I (reigned from A.D 877-89), are among the earliest permanent temples built by the Khmers and mark the beginning of Khmer classical art. See the temples of Preah Ko (erected by Indravarman I in the late 9th century and dedicated by the King to his ancestors), Bakong (the largest and most interesting of the Roluos group temples, it has an active Buddisht monastery) and Lolei (built on an islet in the center of a large reservoir by Yasovarman I, the founder of the first city at Angkor). In the afternoon, continue your temple visits. Included are Prasat Kravan (with its unique brick sculptures), Srah Srang ("The Royal Boths" was once used for ritual bathing), Banteay Kdei (surrounded by four concentric walls), Eastern Mebon (guarded at its corner by stone figures of harnessed elephants, some of which are still in a reasonable state of preservation) and the "Mountain Temple" of Pre Rup until sunset. Visit the ancient capital of Angkor Thom (12th century). See the South Gate (with its huge statues depicting the churning of the ocean of milk), Bayon Temple (unique for its 54 towers decorated with over 200 smiling faces of Avolokitesvara), the Royal Enclosure, Phimeanakas, the Elephant Terrace and the Terrace of the Leper King. Then the jungle-like temple of Ta Prohm embraced by the roots of enormous fig trees and gigantic creepers. In the afternoon, visit the most famous of all the temples on the Angkor plain: Angkor Wat. The temple complex covers 81 hectares and is comparable in size to the Imperial Palace in Beijing. Its distinctive five towers are emblazoned on the Cambodian flag and the 12th century masterpiece is considered by art historians to be the prime example of classical Khmer art and architecture. Angkor Wat's five towers symbolize Meru's five peaks, the enclosed wall represents the mountains at the edge of the world and the surrounding moat symbolizes the ocean beyond. Trip concludes after transfer to the airport for your flight home. Depending on your departure time from Siem Reap, there are many places to bag some souvenirs at one of the local markets. This tour can be customized upon request. Please contact us for further information.